Product prices and availability are accurate as of 2019-04-18 22:55:32 UTC and are subject to change. Any price and availability information displayed on http://www.amazon.com/ at the time of purchase will apply to the purchase of this product. For undergraduate and graduate courses in Business Data Communication / Networking (MIS). 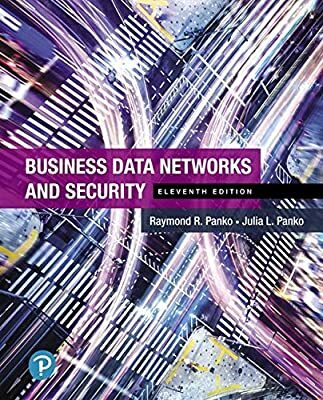 With a clear writing style and a focus on contemporary technologies, Business Data Networks and Security guides readers through the details of networking, while effectively training them for the demands of the modern workplace. Authors Panko and Panko start with the basics –including the Internet, security, and network design – and move on to the latest in networking techniques and wireless networking, all while emphasizing security. The 11th Edition helps readers form a firm foundation, including sound job-related training, in the context of the latest updates and advances in the field.